Albino deer do not have the gene for normal coloration. They lack the enzyme Melanin, responsible for skin, hair, and tissue coloration. The result of this genetic oddity is the total absence of color giving them their white appearance. Albinism in deer is a recessive trait, meaning both the buck and doe must carry the recessive gene for it to occur in their offspring. An albino deer bred to another albino would have only albinos. 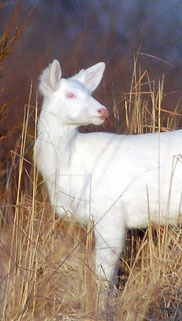 An albino bred to a normal deer without the recessive gene for albinism would produce all normally colored white-tailed deer. But, the offspring from this cross would carry the recessive gene for albinism even though it would be normally colored. When carriers of albinism breed, there is a one-in-four chance that they will produce an albino fawn. The albino deer, other than their color difference, are in every other way the same as regular colored deer...their health is not compromised by the recessive gene. Albino deer are different than the "White" deer found at the former Seneca Army Depot. The Seneca White Deer are leucistic - a reduction in all types of skin pigment, not just melanin. The Seneca White Deer also have normal eye color and not the pink eyes of the albino deer. In addition to the deer being white in color, the eyes of an albino deer are pink because the blood vessels behind the eye lenses show through the deer's unpigmented iris. Poor or failing eyesight is common among any albino creature, due to the lack of melanin. Adding to this issues is the fact that the lack of pigmentation make an albino's eyes much more sensitive to light, which can compromise their vision during the daylight hours. Because of the fascination that the albino deer create, they are more apt to be killed by hunters. Not only because they stand out more due to their white color, but because many hunters see them as a rare trophy.